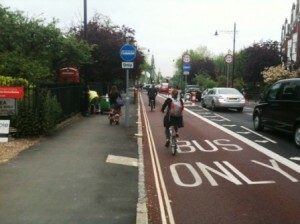 Two years on is it still the most dangerous cycle lane in Richmond? Back in 2011 we reported on what we thought was the “most dangerous cycle lane in Richmond” where a mum was knocked off her bicycle by a car while cycling with her son. Fortunately the child was not hurt but the mother required medical attention. Serious though it was, they were lucky not to have been knocked onto the dual carriageway and hit by the passing traffic. Located on the A316 at the exit from London Scottish Rugby Club car park between Richmond Circus and Pools on the Park cars often exit as speed without looking for passing cyclists or pedestrians. 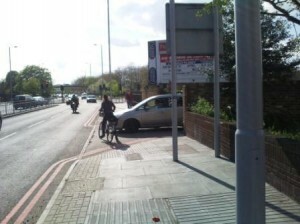 The photograph below shows the danger, a lady nearly knocked off her bike by a car exiting the car park. So what has happened since 2011? 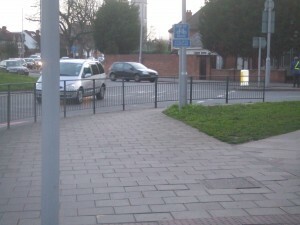 Has the source of danger been removed and as we proposed, the exit closed and cars redirected to use the entrance? Fast forward two years to 2013 and the picture below shows the current scene. 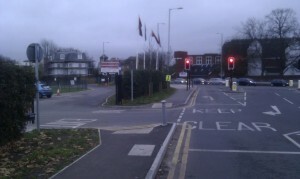 The exit remains open and a new sign has been added off to the side stating ‘Cycles crossing’. 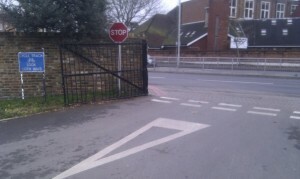 The Stop sign has been replaced by a Give Way sign. No speed bump has been added and we continue to get reports from people cycling along this part of the A316 of close calls with cars pulling out at speed. The sort of person impatient enough to drive out at speed isn’t going to be influenced by the presence of a sign or care that it has changed colour. 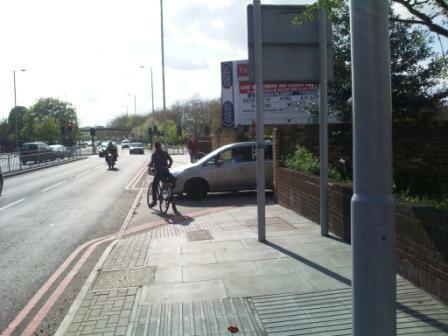 It’s really disappointing that this is the approach to the safety of those cycling or walking along this stretch. People are quick to jump to ban cycling from paths and parks but there is a real reluctance to remove the danger when it is posed by motor vehicles. 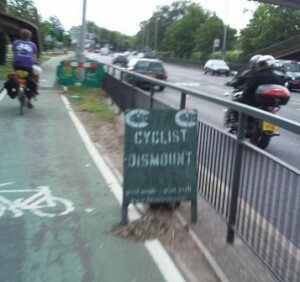 When was the last time you saw Motorist Dismount signs? 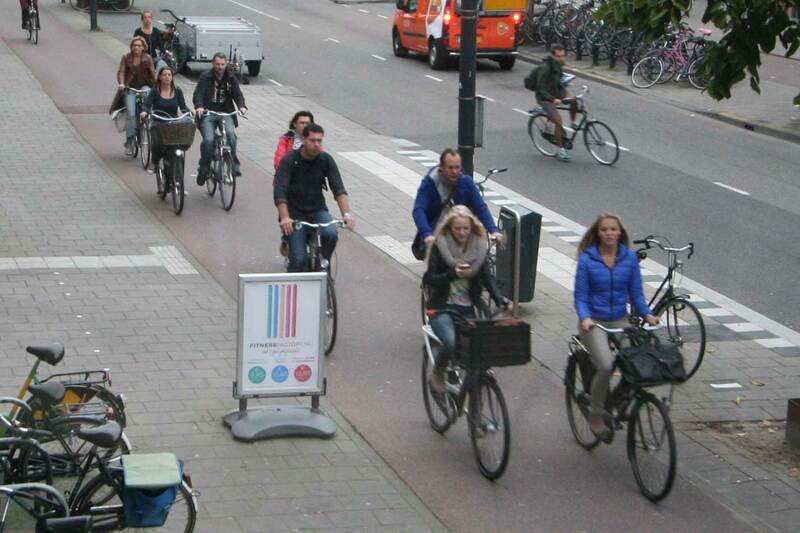 Copenhagenize capture this cultural blindspot really well in this post. As already said, this is a key route in the Borough, and is used by many families cycling to Pools on the Park and the Thames path. 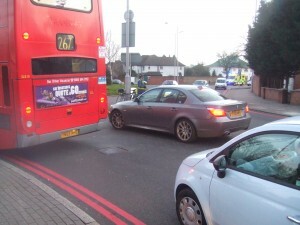 We’ll continue to pressurise TfL on this dangerous section – we met with them earlier this month for an audit of the A316 and this issue was highlighted. You can do your bit to keep the pressure on – raise it via TFL’s online form and email our London Assembly Members – Tony Arbour (GLA Member for the area tony.arbour@london.gov.uk ) and Caroline Pidgeon (GLA Member for Transport – caroline.pidgeon@london.gov.uk) and also the Council’s Cycling Champion, Cllr Harborne (Cllr.KHarborne@richmond.gov.uk), to make the push for this serious safety issue to be resolved (cc us in so we have a record). 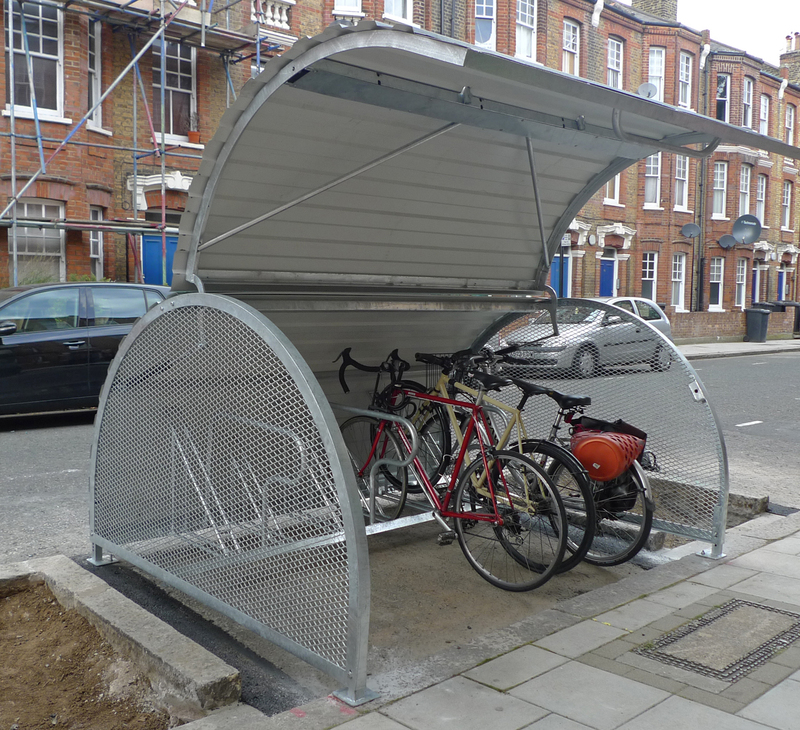 There is also an online discussion of the issue at our Cyclescape page complete with more recent photos. It’s vital that this issue is dealt with, otherwise, next time we may be reporting a more serious incident. The most dangerous cycle lane in Richmond? 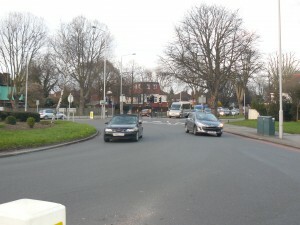 The A316 is the busiest road passing through the Borough of Richmond upon Thames and comes under the responsibility of TfL. Running along side it for most of it’s length are cycle lanes but, as often is the case, there are significant gaps and problem areas along the way that don’t make cycling in our borough as inviting as it could be. 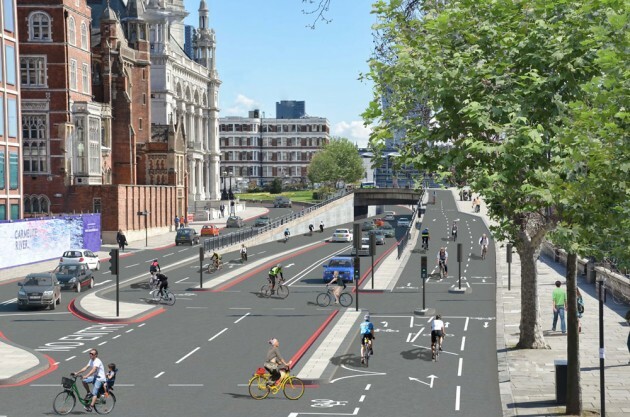 These need to be overcome if we’re to see a much greater uptake of cycling as a means of getting about the borough instead of driving, particularly for families with children. 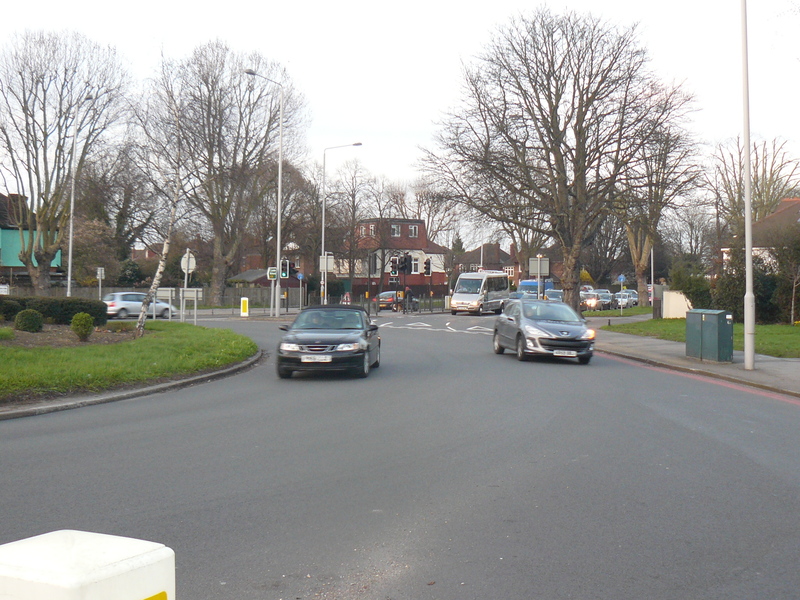 We’ve previously highlighted our struggles to improve safety for pedestrians and cyclists on the London Road roundabout, but there are other key concerns along it’s length, for example the notorious Chalkers Corner. 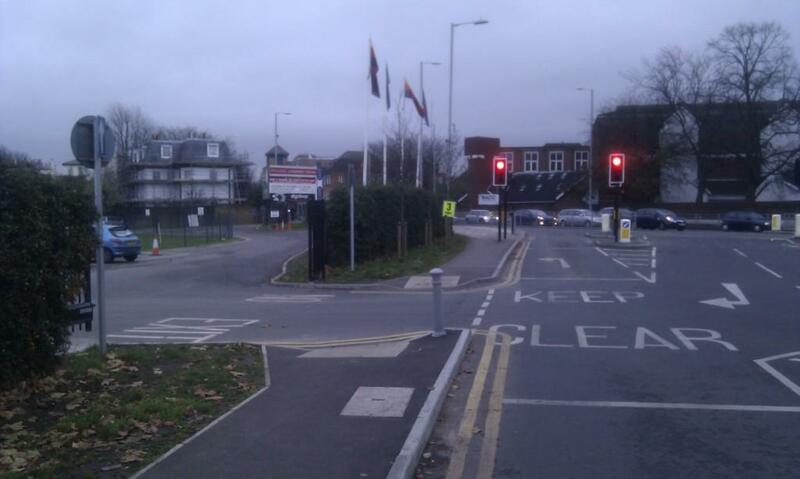 One key area that we’ve been aware of and trying to have resolved since TfL carried out works in 2010 is where the cycle lane crosses the exit from London Scottish Rugby Club car park, located on the A316 between Richmond Circus and Pools on the Park. As we took the photograph below, a lady was nearly knocked off her bike by a car exiting the car park, clearly illustrating how dangerous a section it is. Sadly, earlier this month, a mother and her young son were knocked off their bicycle at this exact point by a car exiting at speed. Fortunately the child was not hurt but the mother required medical attention. Serious though it was, they were lucky not to have been knocked onto the dual carriageway and hit by the passing traffic. 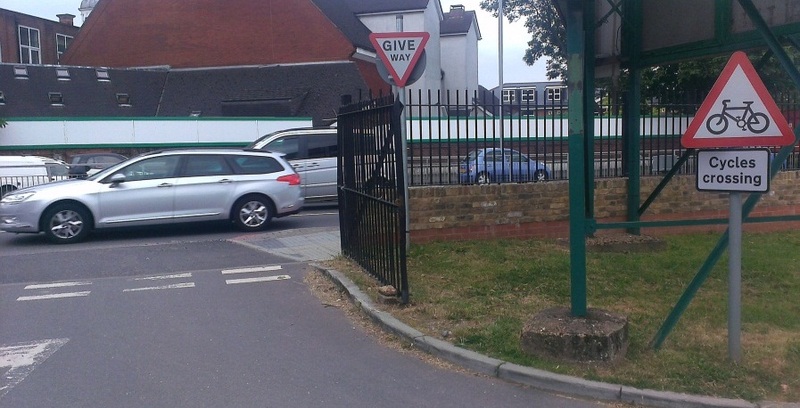 As the photo below taken from the car park shows, cars exiting are supposed to Stop – or is it Give Way – or perhaps its both, as the sign says Stop, but the road markings are for Give Way! Either way, the priority is for pedestrians and cyclists passing by, but as this incident and our photo above show, this is not happening. The problem is further compounded by cars exiting the Pools in the Park car park using the rugby ground car park as a rat run to skip past the traffic lights. 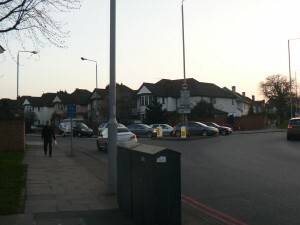 This route is shown in the photo below and cars are frequently observed turning left into the London Scottish car park to then immediately exit onto the A316. The sort of person impatient enough to execute this manoeuvre certainly isn’t going to take the time to check for cyclists or pedestrians. The simplest and safest solution is for the exit from the London Scottish Rugby Club car park onto the A316 to be closed and for cars to exit the car park via the Pools on the Park slips road (where the entrance is already located). In the short term, the signage needs to be corrected and the addition of a speed bump at the exit (something that could be ordered and installed immediately at little cost) would stop cars making a dash for it without giving way (or is that stopping). What is not a solution is to put up cyclist dismount signage. These are not in compliance with the TfL London Cycle design standard and when was the last time you saw Motorist Dismount signs? Doing this states providing safe routes for pedestrians and cyclists is not a priority. 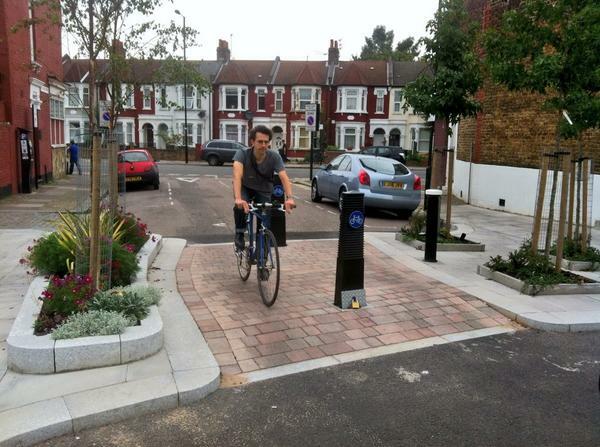 As already said, this is a key route in the Borough, and is used by many families cycling to Pools on the Park and the Thames path. 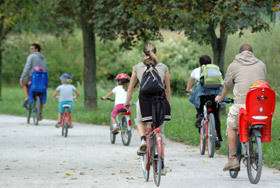 It is also adjacent to Deer Park where Richmond Council are holding the Strictly Cycling Bike Fest on 19th June. Hundreds of cyclists will be cycling past this point on Saturday for the event, if it’s you, take care. Boris Johnson was in Richmond last week, promoting the council’s efforts to boost cycling. Perhaps next time, he’d like to take the opportunity to look at this dangerous situation and have TfL resolve it. 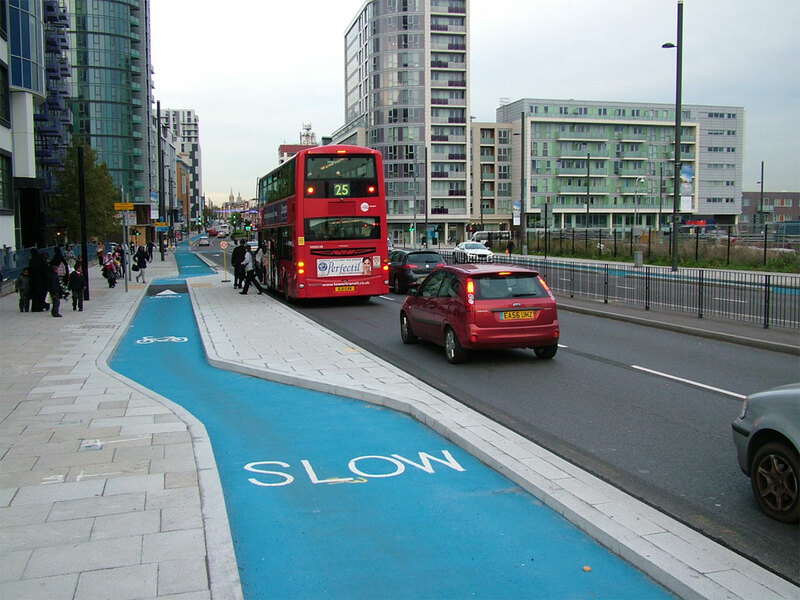 As with Blackfriar’s Bridge, TfL needs to recognise the needs of more vunerable road users. Otherwise, next time we may be reporting a more serious incident.